Should Judge Sotomayor be confirmed to replace Justice Souter? That is the question being publicly debated in the Senate Halls of Washington, D. C. It is always ironic to hear the majority party argue in favor of a candidate nominated by a President of the same party. They, of course, do not want the minority party’s Senators to ask the tough questions that touch on the nominee’s judicial philosophy. The argument is that such questioning unnecessarily politicizes the judicial confirmation process, and will dissuade young lawyers who want to be Federal judges from working on controversial matters. The arguments against tough questioning are ridiculous and undermine the whole point to the Senate confirmation process. The confirmation hearings are meaningless if they do not involve asking the questions that may be uncomfortable for a nominee. If there are questions that create tension, one must ask why such tension exists. Is it merely caused by the sometimes adversarial process of legislating in a two-party dominated Congress? In Judge Sotomayor’s case, I believe there is more to the story. We have seen the videotape of the Judge aptly describing her belief that Appeals Courts are where policy is made. 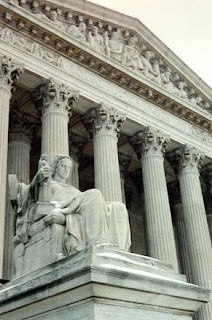 We have also just witnessed the current U.S. Supreme Court reverse her decision involving claims of reverse discrimination made by New Haven Firefighters. Wouldn’t it be interesting if the sitting U.S. Supreme Court justices could provide testimony during the confirmation hearings? Maybe they would have some insight on Judge Sotomayor’s judicial temperament and reasoning process. “As we all know, there’s been a lot of discussion in the country about how the Senate should approach this confirmation process. There are some who believe that the President, having won the election, should have the complete authority to appoint his nominee, and the Senate should only examine whether or not the Justice is intellectually capable and an all-around nice guy. That once you get beyond intellect and personal character, there should be no further question whether the judge should be confirmed. Let us hope our current Senate has the same courage of their conviction.